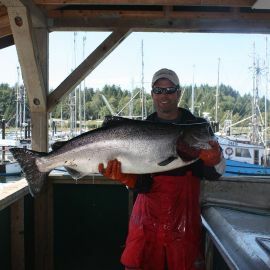 If you’re interested in catching trophy-sized salmon, the Trophy Package is for you! Most fishing trips are designed to catch large numbers of fish but this package is designed to help you catch the biggest fish possible. Sometimes this requires longer travel distances and use of different baits, which may cost more or take more time to set up. Accommodation similar to the Silver Fishing Package. 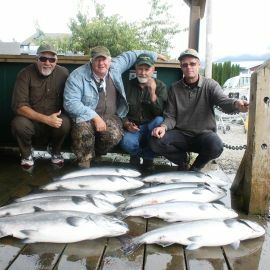 Vacuum packing and cleaning of your catch.The cost of vacuum packing is included. Vacuum packing makes transporting your fish much simpler, and it preserves the fresh taste of your catch even at home. We use professional grade vacuum bags and proper washing techniques to ensure that your fish are well taken care of. 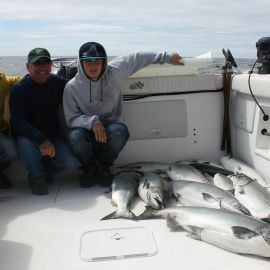 Guided fishing on one of our 25-29 foot boats. All necessary gear is included, and our covered boats will keep you dry and warm. Our fishing equipment is top of the line and includes Scotty downriggers and 10.5 ft Shimano rods and reels. All our boats have toilets.